An unfortunate brush with the law, a riderless customised motorbike, and a chance encounter with a gorgeous hippy girl has wild biker Eddie Rock heading straight for Amsterdam’s red light district to drink, think, and process his reckless antics of previous months. During his sabbatical in the city of sin, a bizarre encounter with a human plant pot and a freak accident in an adult cinema propel Eddie towards the path to redemption and re-enlightenment. Going from two wheels to two feet, Eddie heads to Spain to sort himself out once and for all by walking the fabled Camino de Santiago pilgrim trail, hoping to find forgiveness for a lifetime of bad behaviour. 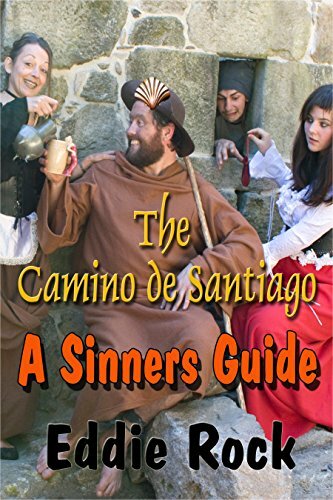 What followed is history and became The Camino de Santiago: A Sinners Guide. The aptly named Sinners Guide is a laugh-out-loud essential item for the modern-day pilgrim. Eddie’s detailed experiences are more like the antics of some of the bawdier characters in Chaucer's Canterbury Tales than the spiritual guidance knocked out about the Camino de Santiago by most other authors. Eddie Rock's book is an honest, entertaining, warts-and-all long walk through alcoholic indiscretions, brushes with the law yet again, and the accidental genital application of deep heat. . And all the while Eddie provides an entertaining commentary upon his surroundings, while never taking himself too seriously. Eddie gives you a refreshing change from the usual run of Camino pilgrimage books, bringing a bit of fun and immorality to the Camino.